Tomorrow the 2013 BBC Proms start with the appealing combination of Benjamin Britten's Four Sea Interludes and Ralph Vaughan Williams' Sea Symphony. I have lost count of how many Proms I have attended, and some years ago wrote here that "I am a huge fan of the Henry Wood Promenade Concerts... they have changed my life". This year season quite rightly celebrates the Wagner bicentennial, but my enthusiasm for the Proms in their current guise is moderated by the wish expressed by Hans Sachs in the concluding monologue of Die Meistersinger that Art be kept genuine. So, on the eve of the new Proms season, I am setting down some thoughts on how Art, as it finds expression at the BBC Proms, can be kept genuine. These thoughts are often at variance with the coverage found elsewhere - see header graphic - and for that I am unapologetic. For years I have been critical of the BBC's stewardship of classical music, a stance that has lost me many friends and followers. But now others, including the chairman of the BBC Trust Lord Patten, are expressing "shock and dismay" at glaring inadequacies in the BBC management process. During his appearance yesterday before the House of Commons Public Accounts Committee the new director general Tony Hall confessed that the BBC had "lost the plot" with regard to key financial controls. So I offer the following thoughts in the hope that they may, in some small measure, help the BBC avoid losing the classical music plot in a similar way. In June this year Concert Club was soft launched with the objective of making BBC Radio 3's "huge back catalogue... more inviting to classical music and opera fans". It took me a while to work out what Concert Club actually is, other than a knee jerk reaction to that poster child of dumbing-down Sinfini Music. But after grappling with the PR spin for a while I fathomed out that Concert Club is an alternative way to make BBC iPlayer classical music content, including Proms, accessible. And in the process I uncovered that, despite having lavish internal web resources, the BBC has partnered with two outside agencies - Lume Labs and Caper - for the two month trial. Moreover, despite having an annual license fee income of £3.4 billion, funding for Concert Club is provided not by the BBC, but by the UK innovation agency. The outside funding for the Concert Club project is probably explained by the BBC blowing £100 million of its IT budget on an aborted Digital Media Initiative that, to quote director general Tony Hall "wasted a huge amount of licence fee payers' money". Even more in fact than another recent cause celebre, £60 million blown on BBC senior staff payoffs. The BBC may sometimes ignore basic journalistic checks, but it has not forgotten how to spend money. And Radio 3 controller and Proms director for life Roger Wright certainly spends money, both with his personal expenses and with the artists that he brings to the Proms. Much has been made of this season's undoubtedly commendable 'Wagner for a fiver'. But what is the true cost of a Proms concert? Despite the concerts being funded from a public levy, it is impossible to accurately identify how much money is spent on them. This is because while the BBC's management activities are open to public scrutiny, its broadcast activities are conveniently shielded from Freedom of Information requests. Which results in the absurd and insidious situation whereby FOI requirements oblige the Proms director to reveal to the stakeholding public the tens of pounds he pays in taxi fares to attend a meeting with an artist's agent, but not the thousands of pounds he commits to paying the artist to appear at the Proms or the commission the agent earns for brokering the deal. To my knowledge the only serious attempt to put a financial cost on the Proms was made by me in a 2009 post titled What price the BBC Proms? As this analysis has never been disputed I must assume it is reasonably accurate. Which means that a Proms season has a total budget of around £9 million and each concert is subsidised to the tune of around £63,000* from licence fee revenue. 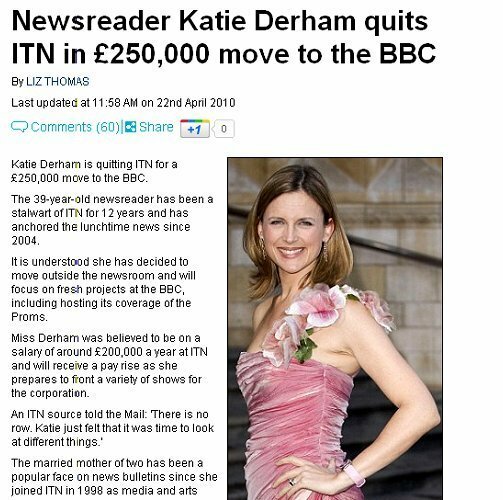 Other posts have reported that top musicians are paid around £20,000 for a single Proms appearance and that the BBC presenter and self-styled Prom queen Katie Derham is paid £250,000 a year - see graphic below. All of which we are told we must meekly accept, because great music demands lavish expenditure, massive subsidies and protection from Freedom of Information requests. But wait a minute, do we really have to accept that received wisdom without question? A short distance across London from the Albert Hall is a shining example of how a different funding model can still produce great performing art. The award-winning Regent’s Park Open Air Theatre attracts almost 150,000 people - around half the total Proms' audience - for its summer season. Its productions include classic plays, Shakespeare, musicals and family oriented productions, and this year's season included a highly acclaimed production adaption of Harper Lee's novel To Kill a Mockingbird directed by the theatre's young, lean and dynamic artistic director Timothy Sheader. All of which is very impressive. But what is more impressive is that the Regent's Park Theatre receives no public subsidy, its work is entirely funded by its own operations and by sponsorship. 85% of the theatre's income is generated by the box office, which compares with less than 25% for the BBC Proms. In a Guardian interview Timothy Sheader made the following comment which classical music would do well to take note of: "I believe totally in subsidies for the arts and I've worked in the subsidised sector most of my life.. however, if the nation is seriously cutting back on public expenditure, the arts have to shoulder some of the burden". Now the point of this article is, emphatically, not to advocate cutting public subsidies to classical music. My point is to question whether the lavish subsidies - £6 million is lavish by anyone's standards - enjoyed by specific institutions such as the BBC Proms and other major music festivals are creatively counterproductive and cause damaging cost inflation by inflating the fees demanded by celebrity performers. It can, of course, be argued quite convincingly that presenting classical concerts is considerably more expensive than staging theatrical productions. But the showpiece Ring cycle at this year's Proms does make an interesting case study. For the Wagner anniversary the BBC is bringing Daniel Barenboim and his Staatskapelle orchestra from Berlin for concert performances of the four Ring operas that are spread across seven days. Now just thinking about the cost of bringing more than one hundred musicians from Berlin and accomodating them in London for a week - let's hope £323 a night is not the norm - makes me wince. Again, we are told this is the unavoidable cost of presenting great music. But do we also have to accept that received wisdom without question? Of course the Proms need outstanding Wagner productions that produce accolades such as this one from seasoned critic Richard Morrison: "a gripping performance of an epic... I would have sat through it all again”. But the significant point is that Richard Morrison was not writing about Barenboim's Staatskapelle Ring; he was writing about a different Ring that could have been presented at the Proms without artistic compromise and at a fraction of the cost of the Berlin production. Those in the know were certain some years back that something miraculous was happening at Longborough Opera just 80 miles from London. Almost a decade ago I wrote here about the promise of Longborough's embryonic Ring, while Anthony Negus' 2003 interpretation of Parsifal for Welsh National Opera remains one of the most profoundly musical events I have experienced in half a century of concertgoing. Anthony Negus' Wagnerian credentials, which include being of the lineage of the great Reginald Goodall, are impeccable, although significantly he has never appeared at a BBC Prom. The Longborough orchestra uses seasoned professionals from the Midlands who can stand their ground against their Staatskapelle colleagues. And Jessica Duchen, whose writing features in my header image, describes the two Longborough sopranos - Rachel Nicholls as Brunnhilde and Lee Bisset as Sieglinde - as "absolutely world class". 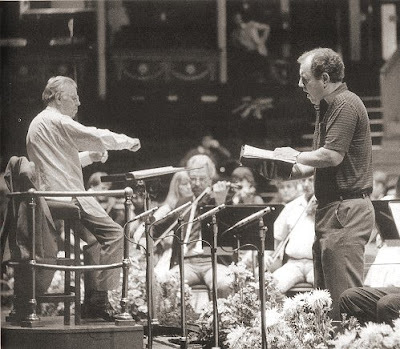 To have brought the Longborough Ring to the Proms would not only have saved a shed load of money - the difference between Barenboim and Negus' fee would be interesting to learn - it would also have been far-sighted and audacious. But today's BBC does not do audacious and far-sighted, it only does predictable and expensive. The tale of two Rings makes a useful case study, but, unfortunately, the problems go far deeper. As I have detailed before, the core problem is that the territorial BBC has been allowed to gain far too much control over classical music. Only when that control is dismantled will the dangers of the ratings driven BBC management totally losing the classical plot be fully defused. Far too much power is exercised, without in my view adequate checks and balances, by the Proms controller and in my 2009 post I set out for discussion how the BBC's control over the Proms could be dismantled to the greater benefit of classical music, and those proposals are appended below. ** Similar concerns were expressed some years ago by someone of much greater authority, the composer and BBC producer Robert Simpson who crtitiqued the vested power structure that controls the BBC Proms in his book The Proms & Natural Justice. 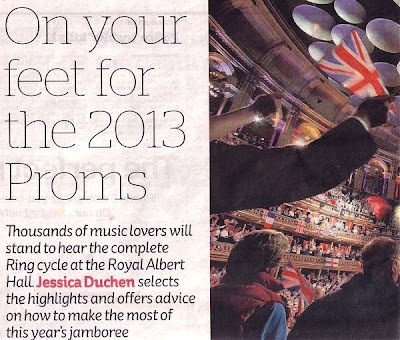 There is always a feast of outstanding music at the Proms, and Jessica is quite right in saying we should be on our feet for the 2013 season. But we also need to be on our guard, and greater fiscal transparency and probity together with less celebrity fixation would be an important step towards bringing this great music festival back in line with the vision of its founder Sir Henry Wood. But, as the president of the Aspen Music Festival and School Alan Fletcher recently reminded us in a prescient speech, music is the mission, not money, So I finish with music not money. The unique and priceless artistic value of the Proms is captured in the photo below which shows Anthony Negus' mentor Reginald Goodall rehearsing Gwynne Howells for the legendary 1987 Proms performance of Act 3 of Parsifal. Read more in Reginald Goodall - the holy fool. * In reality the Proms budget is around £10 million and the subsidy is closer to £75,000 per concert. This is because the Proms benefit from a massive amount of free advertising and promotion on BBC Radio, TV and websites that is not charged to the Proms budget. If this advertising was bought at market rates, as is the case with every other music festival, I conservatively estimate it would cost over £1 million. ** Discussion proposal for restructuring the Promenade concerts as an independent entity. - Separate the Promenade concerts from the BBC and establish them as a stand-alone non-profit organisation. - Negotiate a 5 year contracted annual fee for broadcast rights with the BBC or another broadcaster, including minimum coverage and publicity clauses. - Appoint an independent and innovative Proms artistic director answerable to a board of trustees on a fixed term contract. - The BBC, or other appointed broadcaster, to have one seat on the board of trustees, but no other control over concert content. - Contract a London orchestra and principal conductor to provide a minimum quota of concerts, and reduce the appearances by touring orchestras. - Forge partnerships between the Proms and other arts festivals, including the visual arts. - Publish artists' fees for concerts using banded scales. - Sell the rights to Last Night name and format to Victor Hochhauser for a very large sum. Use money raised for endowment fund for new music commissions. 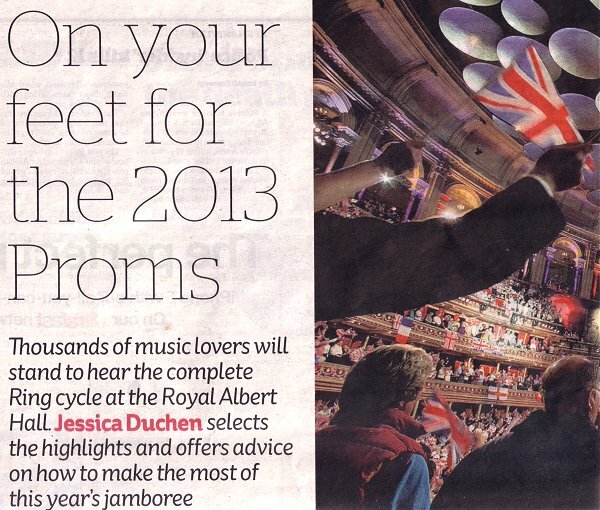 - Question all other current assumptions about the Proms, including the use of the Royal Albert Hall as principal venue. In a Telegraph interview on 11/07/2103 Roger Wright said "Our overall budget is around nine million, and around five million of that comes from the licence-payer". Yet in the 2009 Guardian interview I used for my calculations he said "Of the £8.8m budget for the festival, approximately £6m comes from BBC subsidy". Which means either the BBC Proms subsidy has been cut by £1 million (17%) in four years, or the declared subsidy fluctuates depending on the political climate. As I say in this post "it is impossible to accurately identify how much money is spent on the Proms".